AEDs should be conveniently installed to ensure response within 3-5 minutes. Close to a confined space. Remote sites, such as off-shore drilling rigs, construction projects, marine vessels, power transmission lines, and energy pipe lines. But purchasing your device and mounting it in an appropriate spot isn’t the end of the story. An early defibrillation program is part of a commitment to the health and safety of your employees, customers, and vendors. An AED and early defibrillation program can improve survival rates, raising them as high as 60% in some estimates. For those who suffer a cardiac arrest outside of the hospital, the chance of survival is less than 10%. Brain damage can occur in 4 minutes and for every minute without CPR, the chance of survival goes down by 10%. CPR HOPE is a positive educational experience designed for anyone who desires to learn this potentially life-saving skill; children attending school, family members and friends, or members of our local, education, or business communities. This is your invitation to join us to learn to save as many lives as possible. 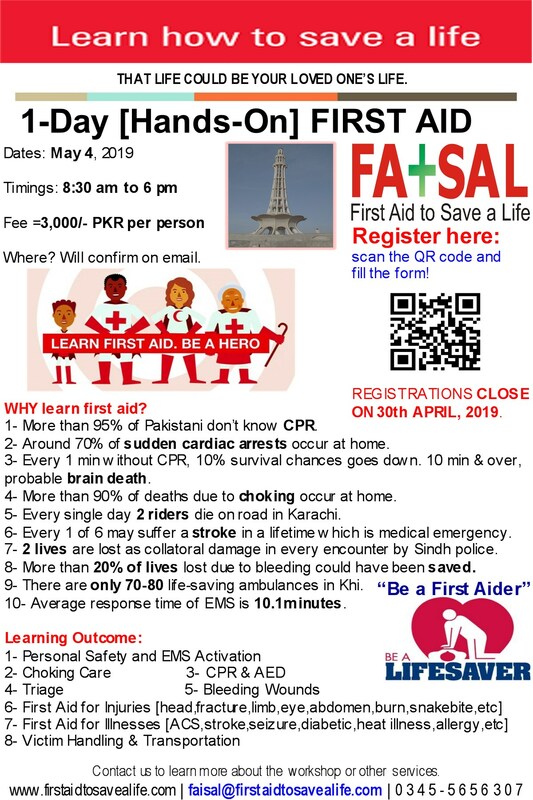 CPR HOPE will be offered on Saturday and Sunday September 6th and 7th, 2014 from 0900 to 1700 hours at Hotel Pak Continental, G-8 Markaz, Islamabad. This entry was posted in 1-Day Training Programs, AED Implementation Program, AEDs and tagged AED device installations, AED Implementation Plan, AED Locations, AED Management, AED Management in Your Facility, AED Placement, AED placement analysis and site survey, AED Placement and Management in Your Facility, AED Placement in Your Facility, AED Program Policies and Procedures, AED Program Tracker, AED Trainings Program, automated external defibrillator, Automated External Defibrillator Purchase Point, Automated External Defibrillator Sale Point, Automated External Defibrillator Training Providers, Automated External Defibrillator Training Providers in Asia, Automated External Defibrillator Training Providers in Pakistan, Can a non-medical person make a mistake when using an AED, CPR, Early Preparedness & Emergency Response (Check) Drills, Early Preparedness & Emergency Response Drills, Early Preparedness Check, Early Preparedness Drills, FATSAL, FATSAL Pakistan, first aid, first aid to save a life, first aid to save a life pakistan, How does an AED work, How much time do I have to respond if someone has a SCA, I know CPR; would not it help, ohsas, ohsas pakistan, Pakistan, Safety Training, SCA Emergency Response Drills, Sudden Cardic Arrest Emergency Response Drills, What does the American Heart Association (AHA) say about AEDs, What First Aid to Save a Life Pakistan can do for us?, What is the recommended treatment of SCA, What is this Sudden Cardiac Arrest, Why Choose AED, Why do we need AEDs. Bookmark the permalink.